Last month, successful entrepreneur and Victoria University alumna, Kati Kasza, shared valuable advice to a diverse group of students, entrepreneurs and working professionals as the first fireside chat guest speaker of 2018. 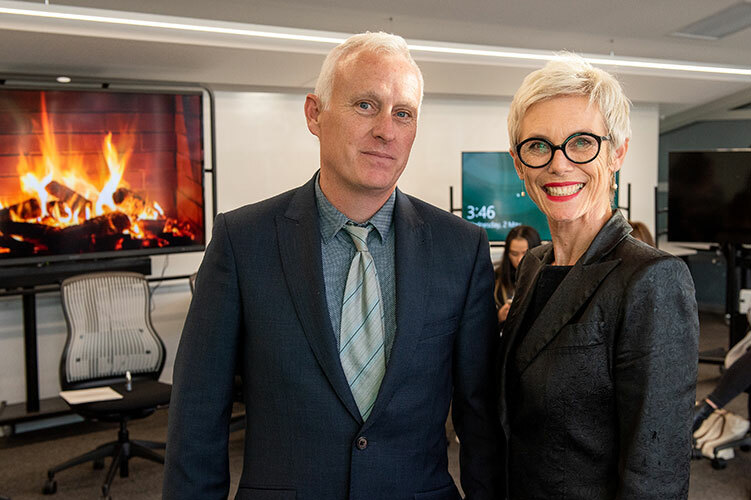 Professor Stephen Cummings and Kati Kasza at the fireside chat at Victoria Business School. Fireside chats, hosted by Professor Stephen Cummings, the Director of Entrepreneurship Programs for Victoria Business School, provide great opportunities to hear from successful alumni and other informative guest speakers. Kati founded the natural beauty brand Evolu in 1997, which was inspired by her lifestyle when she was a flight attendant and her parents—her father was a winemaker and her mother a herbalist—which meant she had the botanical knowledge and passion necessary to start her venture in natural skincare solutions. Evolu is now a leading brand in the beauty industry, with its Invigorating Body Scrub winning the Best Natural Beauty Award at the 2018 Best Beauty Awards—cementing Evolu as a leading brand. Starting your own business is difficult—you need both grit and grace. Having grit is when you want to give up but you keep on going. Having grace comes from learning to balance and manage yourself. A key point for entrepreneurs starting a brand is to think of it as a living person. Ask yourself ‘If you met this brand as a person would you like them? Would you tell people about them? And if so, what would you tell them?’ Kati emphasised the importance of first impressions when it comes to marketing a brand. There is no ‘right’ moment to start a business, you just need to take the leap. An element of youthful naivety can sometimes give you the courage necessary to take this first step, but it is extremely important to have an extensive business plan before you take any risks—this is crucial to the success of a new business. Kati believes that from her experience the best advice for university students is to get more involved and do things that take you out of your comfort zone. Kati described herself as shy at university and said that she didn’t network as much as she should have. She really emphasised the importance of getting involved and taking advantage of the opportunities offered. Many of the audience were women who were interested in the success of Kati as an empowered female herself. The advice given was to have value in your own worth. Enter into any environment knowing yourself, your goals, what you believe in. She claimed to not notice an imbalance within the beauty industry, but explained that if you do encounter a sexist constraint, manage it. Know what you are entitled to and don’t let anybody disempower that. It is always a valuable experience being able to hear from someone relevant in New Zealand business, especially someone who is a Victoria University graduate. Thank you to Kati for taking the time out to share her insight. We definitely all left the room with more enthusiasm and energy towards entrepreneurship. Tori Scorringe is a third year Commerce student and Shaun Denny is a third year Commerce and Law student.